If you’re out on the town with another healthy eater and decide to have one glass of your favorite beverage, only to be told by your companion that drinking an alternative might be healthier, you’re probably ordering either beer or wine. There seems to be two groups of people when it comes to an occasional glass of alcoholic beverage, the beer drinkers and the wine drinker. If you’re trying to choose the healthiest, you’ll need to know all the beer vs. wine health benefits. In most cases, the person that only has an occasional drink should let their preference be their guide, as long as they’re splurging. Beer can really create a beer belly if you drink too much. Beer has fifty percent more calories when you compare the average serving size of beer to the average serving size of wine. The beer comes in a larger glass, so ounce for ounce it’s about the same, but normally, you’ll get more beer in one serving. There are also more carbs in beer, not to mention the gas and bloating it can cause. It’s really tough to get an adequate measure of calories, since it varies so much by type in both wine and beer. The key goes back to the occasional drink and limiting it to one. Wine has heart health benefits. Red wine, in particular, contains polyphenols that help reduce the risk of heart disease and also prevent high blood pressure and diabetes. The polyphenols are anti-inflammatory and anti-oxidants that help to protect the cells. They also can be rejuvenating. If you compare white wine to beer, they’re about the same when it comes to the amount of polyphenols, so they do offer some health benefits, but not as much as red wine. That doesn’t give a pass to binge drink, but does mean the occasional drink isn’t as damaging. There’s a reason the worm is dead in the tequila bottle. Since both wine and beer contain polyphenols, both start out ahead of hard liquor like whiskey and tequila, but even those have some redeeming qualities. Alcohol alone won’t kill bacteria and parasites, but when combined with the other ingredients in wine and tequila, have proven beneficial for that purpose. One study shows that tequila that is 10% alcohol has the potential to kill pathogens such as Montezuma’s revenge—E. Coli—and even kill salmonella. A study of the outbreak of cholera in France in the early 1900s indicated that those who drank wine were far less susceptible to the disease. Still, a further study shows that both beer and wine drank regularly (with wine being more effective), but in modest amounts can prevent ulcers caused by H. pylori and therefore reduce the risk of stomach cancer. While there are some health benefits for both beer and wine, red wine seems to come out ahead in most cases and is served in smaller glasses, so one serving has fewer calories. The number of calories in both wine and beer vary by type, just as the health benefits do. 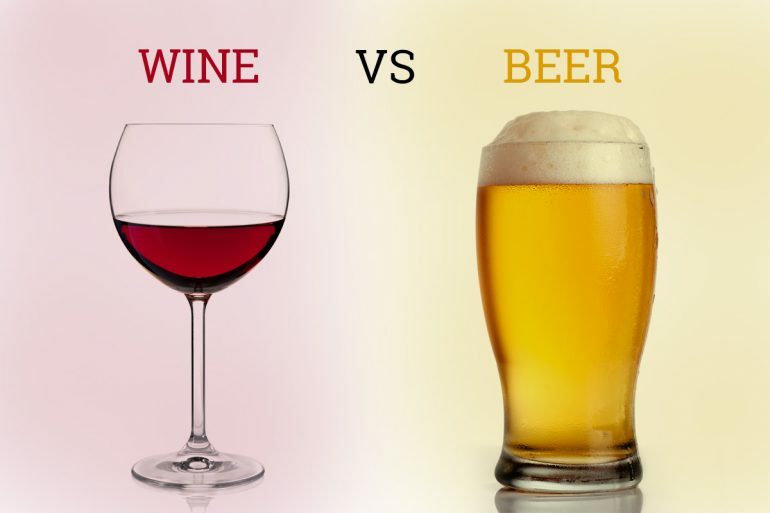 Most studies show that an occasional drink actually has benefits, but more isn’t better in the case of wine and beer. In fact, the more you drink, the faster the benefits drop behind the negatives of drinking. Marinating meat with grape juice of any type, whether it’s the straight up Welches or the best aged wine, can kill the bacteria Campylobacter in the meat within 15 minutes, which causes food poisoning or traveler’s diarrhea.